Unfortunately, we‘re all too aware that fire season is upon us again. With the Crescent Mountain and McLeod Fires still actively burning and the thick smoke from 500+ fires in British Columbia, we are constantly reminded that summer is fire season in the West. Despite all the doom and gloom, there are plenty of reasons to be thankful! As a reminder, in April TwispWorks hosted and facilitated a meeting between the Pacific Northwest Regional Forester, Jim Peña along with many other Forest Service staff, and the NCSB Regional Partners (our working committee of locally elected officials and area experts). The purpose of the meeting was to establish multi-jurisdictional working partnerships to facilitate the timely advance of the USFS’ stated objective to maintain the North Cascades Smokejumper Base in Winthrop. Following that meeting, the Region listed NCSB is the #1 priority for aviation infrastructure improvements and received funds for a site proposal. As of early August, the site proposal went out to bid and the contract has been awarded to CTA Architects Engineers; the contract coordination work is starting between the Okanogan-Wenatchee National Forest and the selected contractor. The site proposal will provide a detailed suite of options to remove the three buildings that are currently in the Object Free Area of the runway and reconstruct them elsewhere on the base. I’m happy to report that John Doran was able to donate about $200 to the National Smokejumper Association from the proceeds of the 3rd Annual ‘Keep Our Rivers Clean and Our Valley Green Music Festival’; this year’s theme was Support the Base. Unfortunately, a large afternoon thunderstorm kept some folks away on June 16th, but for those who turned out the weather improved throughout the evening and music, food and drinks were enjoyed! Rob Allen, the Okanogan-Wenatchee Fire Staff Officer, attended and gave an official update from the Forest Service. He reiterated that NCSB is the #1 priority for the region for aviation infrastructure improvements. And finally, on August 10th Congressman Dan Newhouse was invited to attend a joint Winthrop and Twisp Chamber of Commerce meeting; the Chambers wanted to thank the Congressman for his support of NCSB, the Headwaters Campaign and his recognition of the Methow Valley Ranger Distract as a priority area under the National Forest System Trails Stewardship Act. Ashley Thrasher was able to speak on behalf of TwispWorks and the NCSB Regional Partners to thank the Congressman for his support of the Smokejumper Base. Check back in soon to hear more updates, or feel free to email Ashley for the latest information at athrasher@twispworks.org or call her 997-3300 ext. 10. 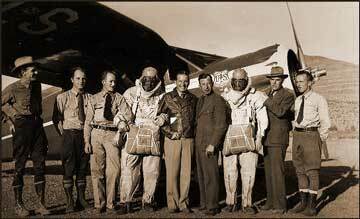 TwispWorks continues to lead the effort to keep the North Cascade Smokejumper Base (NCSB) in Winthrop. Earlier this year we drafted a letter on behalf of the commissioners to the USFS Regional Forester, Jim Peña, requesting a meeting to support the Forest Service’s effort to obtain the funding necessary to keep the base operational. We are happy to report that Jim Peña accepted our request; he and additional Forest Service staff will be meeting with our county commissioners and mayors on April 24th (time TBD) at TwispWorks. This meeting is open to the public, but there will not be time for public comments. TwispWorks is pleased to host the meeting on April 24th at the Education Station. With our rich history as the former site of the Twisp Ranger Station, it is fitting that the Forest Service will once again be utilizing this space! TwispWorks has been leading the preparation for this meeting because this issue directly supports our mission of increasing the economic vitality of the Methow Valley. The North Cascades Smokejumper Base is integral to the economy, culture, and disaster preparedness of the Methow Valley. Providing sixteen permanent jobs, multiple contract positions and nearly $800,000 of direct annual Federal spending, the base supports many local families and, by extension, our whole community. In other news, the North Central Washington Economic Development District (NCWEDD) selected the retention of NCSB in Winthrop as their #1 priority for 2018. Thank you NCWEDD! With this classification, we receive assistance with researching and writing grants and administrative assistance from NCWEDD. And finally, mark your calendars for June 16, 2018. John Doran is hosting the 3rd Annual ‘Keep Our Rivers Clean and Our Valley Green Music Festival’; this year’s theme is Support the Base! This is a great opportunity for you to listen to some music, eat and drink some local goods, and show your support for keeping the Smokejumper Base in Winthrop. Our work is not over! Unless the Forest Service can find the $5.2 million needed to upgrade the base in the next 2-3 years, they will recommend the base move to Wenatchee. This means a strong community voice calling for investment in the base will be needed! It will take all of our voices to keep the base at its historic location in the Methow Valley! 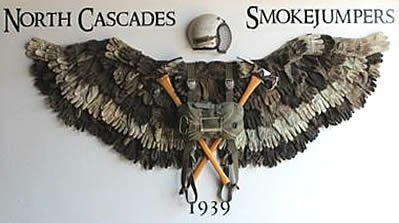 The North Cascades Smokejumper Base is integral to the economy, culture, and disaster preparedness of the Methow Valley. Providing sixteen permanent jobs, multiple contract positions and nearly $800,000 of direct annual Federal spending, the base supports many local families and, by extension, our whole community. Its location on the edge of some of the steepest and most inaccessible terrain in the Northwest has helped ensure a rapid response to devastating fires such as the ones that impacted the Methow Valley in 2014 and 2015. And with over 3,000 annual visitors, the base’s unique heritage as the birthplace of smokejumping is a pillar of local tourism. Currently, the Okanogan-Wenatchee National Forest is completing a Preliminary Project Analysis to study the costs and benefits of updating the current base near Winthrop or moving it out of the Valley. Check back soon for a timeline and ways to get involved. It will take all of our voices to keep the base at its historic location in the Methow Valley!